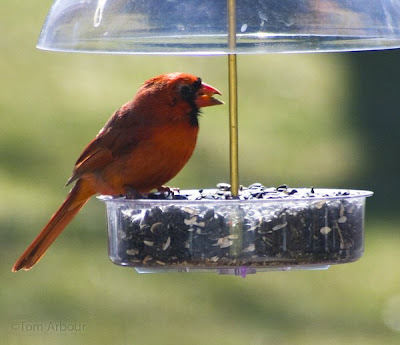 I came to take northern Cardinals for granted when we lived at our last house. Our neighbor had been feeding birds for years, and dozens came to the feeders that I set out only feet from his yard. That hasn't been the case at our new house. I would see cardinals alight on our fence and wires, but they were just staging to land at the neighbor's feeder. Finally, in the last two days, the Northern Cardinals have come to our yard to feed as well. It is certainly a nice feeling- I'm doing what I need to do to lure the birds to our yard. Great! Once they come, they will stay! Especially if you have a lot of bushes for them to hide in. They love my forsythia bushes. Maybe we can lure some cardinals over to Western Washington. It would be nice to see such vibrant colour in the birds at the feeders here. I hope spring has arrived for you Tom. I agree! Whatever it takes to attract those beauties! Congratulations! We still have our Cardinal Emporium around here. While enjoying dinner this evening out on the deck, we counted 13. Looking forward to the chicks, of course. Not for a couple of months yet, though.